Caesars Palace is a casino/gambling game that features 8 games – scratchers (more on those later), slot machines, video poker, blackjack, roulette, craps, keno, and horse racing. The horse racing game immediately caught my eye because you don’t normally see that in a casino-based video game. You can look at the stats for each horse as well as results from previous races to aid you in placing bets, which adds to the realism. Unfortunately you don’t get to watch a simulated horse race; a small animation appears on the television screen above the betting stations showing two horses running. After a minute or so, a screen pops up showing the results and your winnings, if any. ATM machines are scattered throughout the casino, allowing you to check your balance, obtain a password (the game doesn’t use a battery-based save system), and peruse through all of the game’s sound effects and music, an odd but cool inclusion. ATM machines also allow you to buy any of three types of scratcher lottery tickets. Each scratcher has a theme, but they all boil down to minesweeper-style gameplay. Each costs $100, and the payoff depends on how many spots on the ticket you can scratch off before you uncover a bomb. You must cash in the ticket before you uncover a bomb, or you will lose the whole $100. 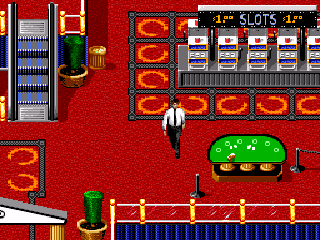 Your character can walk throughout the casino, playing any at any machine or table. The game feels weird though, in that you are completely alone in the casino, which doesn’t even have dealers standing at the tables. This is the only major complaint I have with the game. The interior of the casino looks great, and Tommy Tallarico’s music and sound effects contribute to the ambiance, but the fact that it’s totally empty really detracts from the overall atmosphere. I don’t see what the big deal would have been with throwing a few animated sprites in there. Nevertheless, Caesars Palace is a solid gambling game that should satisfy the highest of rollers. Buy Caesars Palace on GameGavel or Amazon. Tagged Caesars Palace, Casino, genesis, Review, sega, Tommy Tallarico. Bookmark the permalink.